The New Dork Review of Books: Does E-reading Change the Way You Read? Over at the Huffington Post, writer Mark Rubinstein lays out a case for why some people are still resistant to ereading. He doesn’t demonize these folks, but instead offers a reasonable explanation for why they’ve stuck to paper. Paper reading reminds people of childhood, when their love of reading first emerged, he says. I’ll buy that — makes sense to me. But I have a different (or, at least, supplemental) explanation: People are resistant to ereading because they fear that ereading will change the very specific ways they’re used to reading books. As Rubinstein points out, people resistant to e-reading aren’t necessarily resistant to technology specifically, or change in general. So, to me, it’s just that they fear this one particular aspect of change. And they’re right. 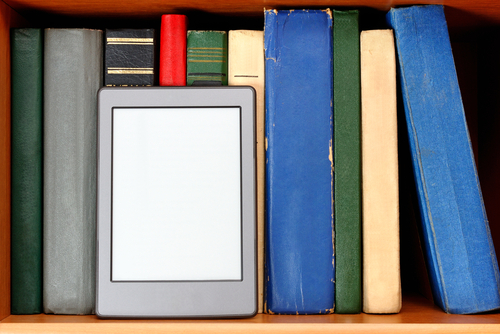 Ereading will fundamentally change the way you read. It has for me. But that’s not a bad thing. Most importantly, I read a lot more now. Not an exclusive ereader, I usually have an ebook and a paper read going at the same time. And so this has led to more finished books. And that’s a great thing! The numbers don’t lie — I read nearly 20 percent more books last year (my first full year with an e-reader) than my best reading year since college (thank you, Goodreads stats). And I’m on pace this year to shatter last year’s record. But it’s not just more, it’s also different. The availability of library ebooks has opened up a pathway to books I’d never have read otherwise — another huge benefit of ereading. From Erin Duffy’s Bond Girl to Maggie Shipstead’s Seating Arrangements, I’ve read and really enjoyed novels I would’ve probably missed without the library. And it’s not just novels: I’ve read more short story collections in the last year-and-a-half than I did in my entire previous reading “career” combined. How could I have considered myself a reader without ever diving into a George Saunders collection?! The NY Times, earlier this year, attributed the “new” popularity of short story collections to ereading. I’m Exhibit A for that theory. Please know, that if you’re resistant to ereading, none of this intended to demean your choice in any way. Keep doing what you do if it’s what is comfortable. I just wanted to relay the story of how one dyed-in-the-wool paper reader overcame his hesitancies. Remember, ereading vs. paper reading is not an either/or proposition. Ease your way into ereading. Or don’t. Just read however you want, ’cause reading is pretty awesome. If I didn't see books in print at the library, I'd download more of their ebooks. I'm not sure I understand your point her. Are you saying ebooks are unnecessary because they're already available in print form? My amount of reading was totally changed by getting an ereader, too. I'll admit it, I am HORRIBLE at returning library books. Like, let a book sit in my car for two weeks intending to return it horrible. It was so bad that I had stopped checking books out and was reading fairly minimally - until the glorious world of ebooks opened to me. I could check out and return a book with a click, and I was doing it ten fold. That's a great story! (I'm like with Netflix movies, but that's a whole different thing. ;) ) Yeah, the library is so convenient - except here in Chicago, there's always a long waiting list for ANY book. But that's okay. I don't have an ereader and won't until they stop making paper books. I just like the physical medium. I'm content with reading the amount of books I read and I view my library as a collection (I also have a huge room with plenty of room to grow, though). And it's not that I shun technology; my iPhone gets plenty of quality time and I love my Mac Book and streaming Netflix on our TV when I work out with my treadmill that has -gasp- a computerized screen. I guess I'm just old fashioned! Haha - hey, to each her own. That's one of the points Rubinstein makes in his piece, actually: that people who don't eread aren't necessarily people who don't like technology. That's not often the case, in fact. I do still like the physical medium too, and probably a little more so than ereading, but ereading has a lot of conveniences, too. Since owning an iPod, I've found free books on iTunes and have jumped right into the deep end of downloading books from there and reading them. It's nice to be able to read something interesting when you can't cart a book with you somewhere - like a hospital or in a car full of people. But I do have two other traditional paper books on the go as well - actually they're in the second drawer of my bedside table so I can grab them when I want them. And if you have gander at My Reading List of what I've read this year, I've ploughed through 8 books; 4 of which have been e-books... not a bad thing really, but I have noticed that I need to go to my optometrist for new glasses... or is that just me? Funniest thing is that I still go out and buy traditional books... and it's mainly because I love the feel of the pages and smell of the new and odour of the old... whereas the e-books don't have any of that going for them. Sounds like you are Exhibit A for the point about paper/ebooks not being an either/or proposition. There's plenty of room for both in all of our reading lives! I definitely still buy traditional books, too - just not as frequently. I resisted buying an e-reader for a long time. I finally caved when I wanted to be able to review e-books. Now? I love my Kindle. It's not the same kind of love that I have for tree books, but it's a sort of love ;) It's convenient for one thing, that's for sure. No one mentioned us old folks whose eyes aren't what they used to be. With e-readers you just increase the font size. I have a Kindle and an Ipad and read on both (depending on whether I'm inside out outside). I also LOVE magazines on the Ipad: Time, Entertainment Weekly, This Old House, Southern Living, Consumer Reports. The e-magazines leave the print magazines in the dust! My reason for not wanting an e-reader was that I wouldn't be able to feel and smell the pages, but as a fan of technology it was weird for me to see everyone else with an e-reader and not want one myself. Then it dawned on me that when I'm awake in the middle of the night I could actually read if I got the right e-reader. Now I have a Kobe Glow and I love it for making my sleepless hours productive. It is perfect for that. Most of the ebooks I read are classics I get free, which is great except for the messy formatting in some of them. Probably if I got them from a library they'd be better. I tried an ebook for book club for the first time and for that I didn't like it at all. I can't hold it open to several different passages at the same time with my fingers. I can go back and find passages I've highlighted but it takes too long in a book club setting. I'll never give up my beloved "real" books, but I'm glad I got the Kobo and wouldn't want to do without it now. I like that you were willing to try an ereader, despite your love of the traditional - and still found some use for it. I've also noticed a HUGE increase in the short sort story collections I've been reading since I fully embraced my kindle. Very nice - hard to believe all that I was missing before. Makes me a little sad. I read library ebooks (never overdue! ), Edelweiss ARCs (they expire! ), The New Yorker (no more stacks! ), and ebooks on my Nook 1st & Nook tablet, as well as working through my hard-copy collection. Reading in the dark is a true find, like with my flashlight, so many years ago. Checking words in the built-in dictionary is enlightening. For book group, I highlight critical passages, then review them all in a row before we meet. And I LOVE being able to grab a book's preview pages as soon as the New Dork Review mentions it. Reading has been expanded, though time's been compressed. I love reading books and e books just the same. I have to admit it is more convenient having all your books on one device instead of a bookcase filled with books. Since I purchased my e reader I have read more books than I would if I had to purchase a book and read it on paper. I'll add another reason to that - I don't like ereading much because after a certain point, all books begin to look the same to me. To me books are not just about the stories they tell but also the experience of holding the book in my hand, feeling the page and most importantly, when I think back to the book, the picture that comes to me is the book itself. When I read it on an ereader, it doesn't feel like a real book to me.